The aim of this course is to review low back pain facts, assessment and treatment for guiding clinical physiotherapy practice. The course centres on a pragmatic approach to the assessment and treatment of low back pain, both acute and persistent. An evidenced informed and broad based focus will be employed, while reviewing current knowledge of LBP, breaking myths and addressing controversies and offering a thought provoking course. The ultimate goal is to stimulate a rational and balanced approach to the clinical management of low back pain. The context of the course includes the biopsychosocial model, diagnostic triage, pathoanatomic assessment and testing utilising likelihood ratios and review of selected clinical prediction rules, and guideline treatment review. The course will offer a clinically relevant knowledge base to compliment current practice and build clinical confidence in the management and education of persons with low back pain. The course has a didactic and practical element. What is the natural course of low back pain and why is this important to know? What are the common, not so common and not to be missed causes of low back pain? What is “low back pain triage”? What is peripheral and central sensitisation and pain modulation? What are the basics we need to know? What are risk factors for low back pain and can they be modified? What are the risk factors for athletic low back pain? What is the problem with imaging and low back pain? Why image? Why not? What can be a potential source of low back pain? And what are these common referrals patterns? What is generally relevant in assessment? Is there a place for pathoanatomic assessment of LBP? What are the limitations of assessments and examinations and special tests? What do tests infer? Can discogenic pain be reliably diagnosed? Do pain provocation tests play a role in the assessment of the SIJ? What is the difference between discogenic pain and radiculopathy? What are the differentiating features? What is spinal stenosis? What are the presenting features? How is the hip relevant to low back pain? Can facet joint pain be reliably diagnosed? What do the tests tell us or not? What is Revel’s criteria? Are myofascial trigger points relevant in LBP? What is multimodal and multidimensional and active and passive treatments? Do patient expectations play a role in treatment outcome? What is the Hawthorne effect? How is it relevant? The problem with studies…? 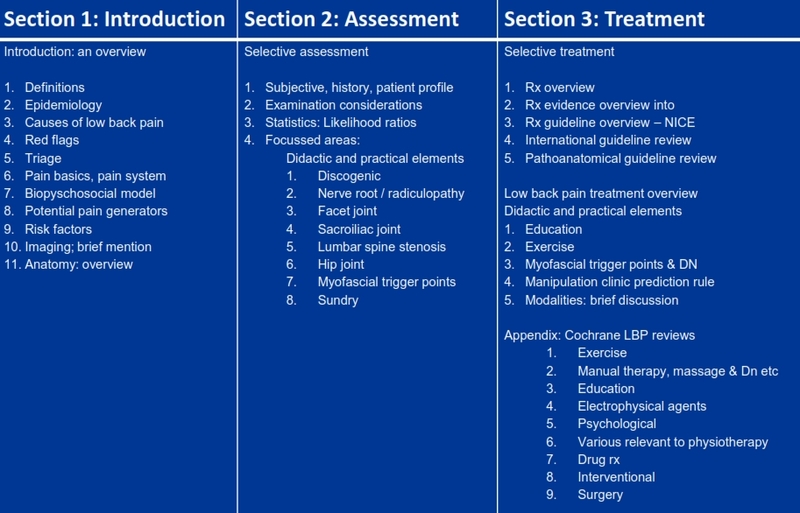 What are the NICE guidelines and how can they assist in a pragmatic approach to low back pain? What role does education play in acute and persistent LBP? Is there a difference in evidence? What are common patient (and clinician) misconceptions about low back pain? Exercise and LBP, what is important? Does exercise need to be specific for LBP? What is comfort and threat? Why is this relevant? approaches and myofascial pain syndrome and dry needling. In his spare time he likes to mountain bike! 30 available	 LBP - 6-7febr20 €500,00 50€ (excl btw) cateringkosten inbegrepen in vermeld bedrag.